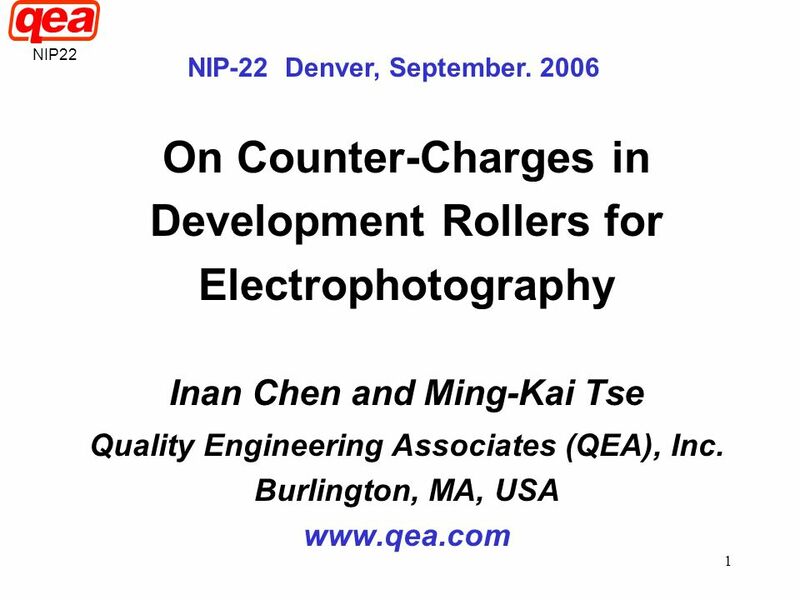 NIP22 Counter-Charges in Development Rollers for Electrophotography Latent images developed by moving Charged Toners - Extensively studied. Counter-charges : Little attention - Reside in carrier beads (2-component development), or development rollers (Single-Component Dev.) 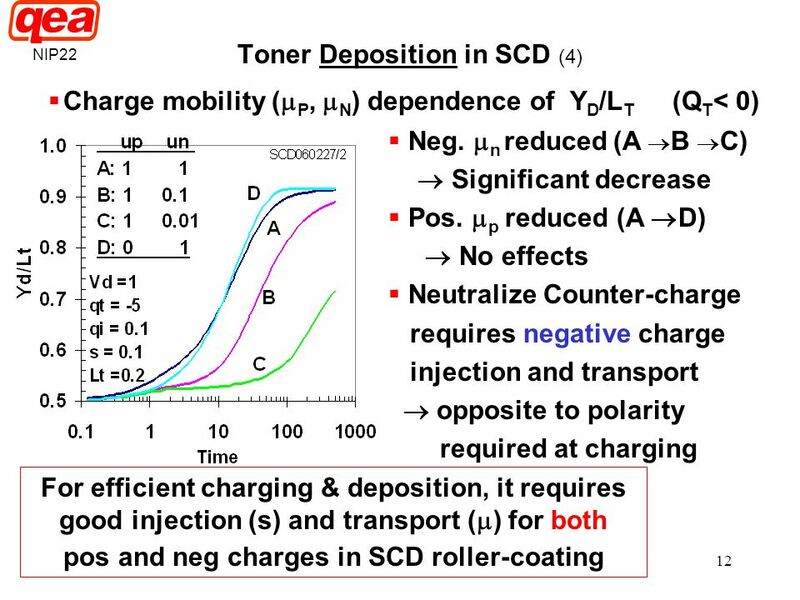 Objectives: Quantitative analyses of roles of counter-charges in Toner-charging and Toner-deposition in SCD Requirements for ideal roller coating materials, and characterization method for SCD rollers In electrophotography, latent images are developed by moving charged toners from their supplier to the photoreceptors. Extensive works on the measurements and analyses of toner motion have been reported in the literature. In contrast, little attention has been paid to the motion of counter-charges that reside in the carrier beads in two-component development, or in the development rollers in single-component development (SCD). 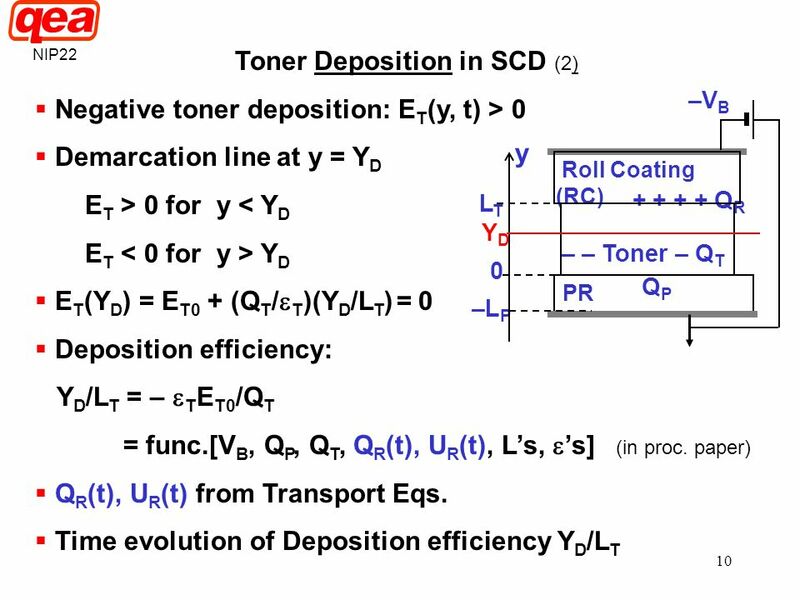 The objective of this paper is to quantitatively analyze the roles of counter-charges in the toner-charging and toner-deposition steps in SCD, and determine the requirements for ideal roller coating materials, and characterization method for Roller characterization. NIP22 Single-Component Development (SCD) 1. Development Rolls: Conductive elastomer core Semi-insulator Coating MB Dev. Roll PR VB 2. 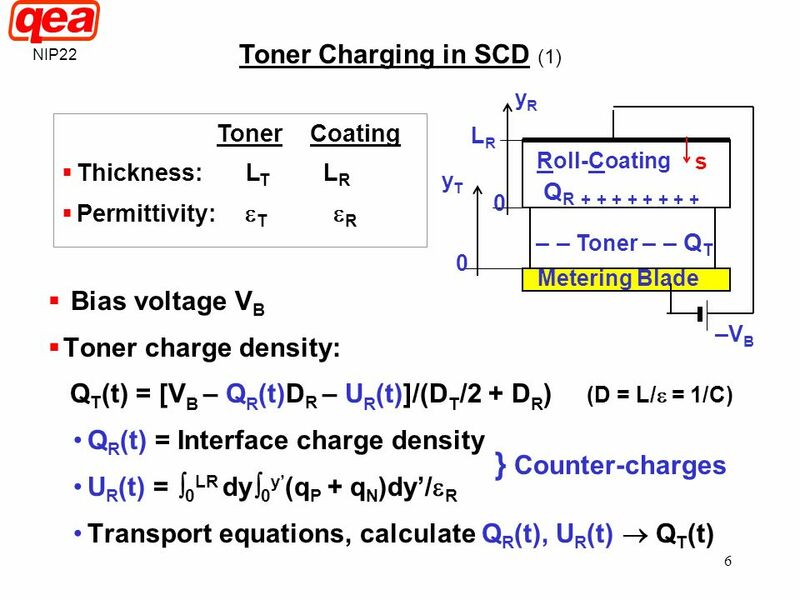 Toner Charging at Metering Blade (MB): Charges supplied to toner, Counter-charges to Roll coating 3. 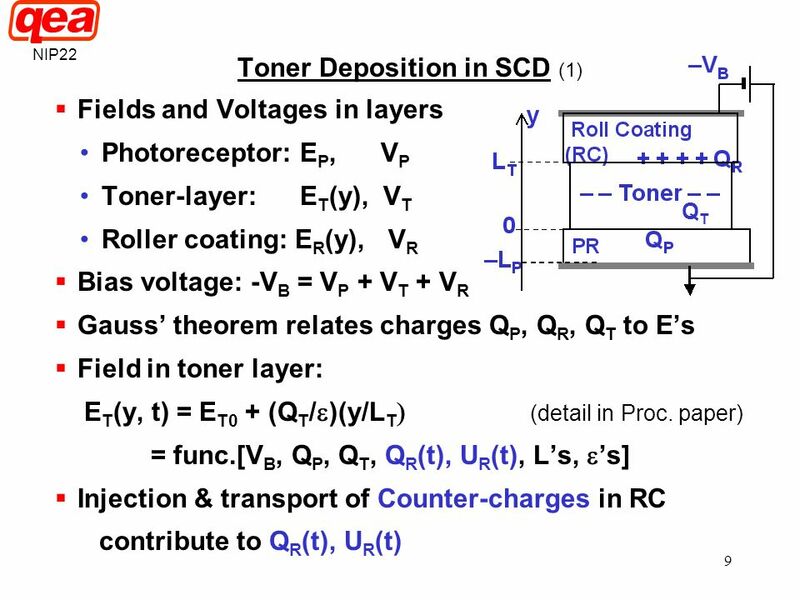 Toner deposition: Charged toners move to PR, Counter charges impede toner motion, must be removed (neutralized) to improve deposition efficiency 1. 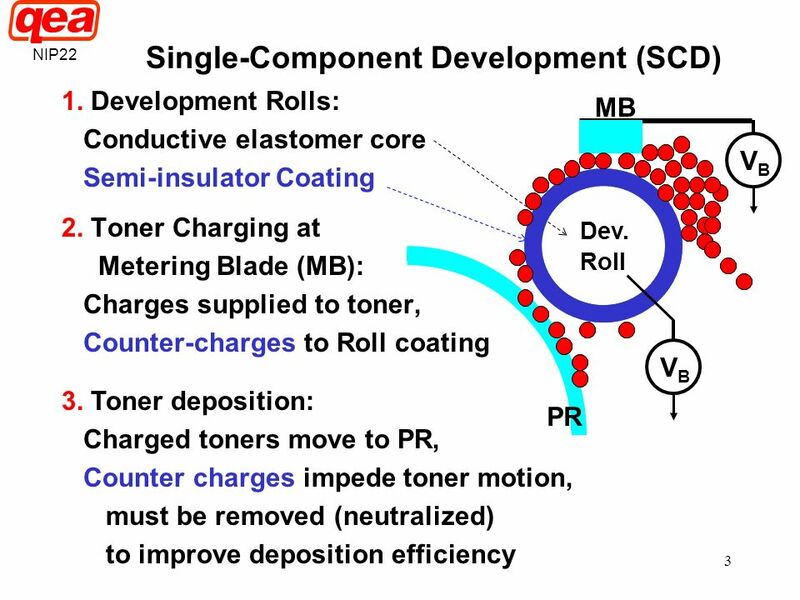 In SCD, the development rolls consist of a conductive elastomer core surrounded by a semi-insulator coating layer. 2. Toners are charged as they pass through the metering blade. At the same time, counter-charges are induced in the roller coating layer. 3. In the deposition step, toners move toward the PR, counter-charges impede this toner motion, and must be removed, or neutralized in order to improve the deposition efficiency. 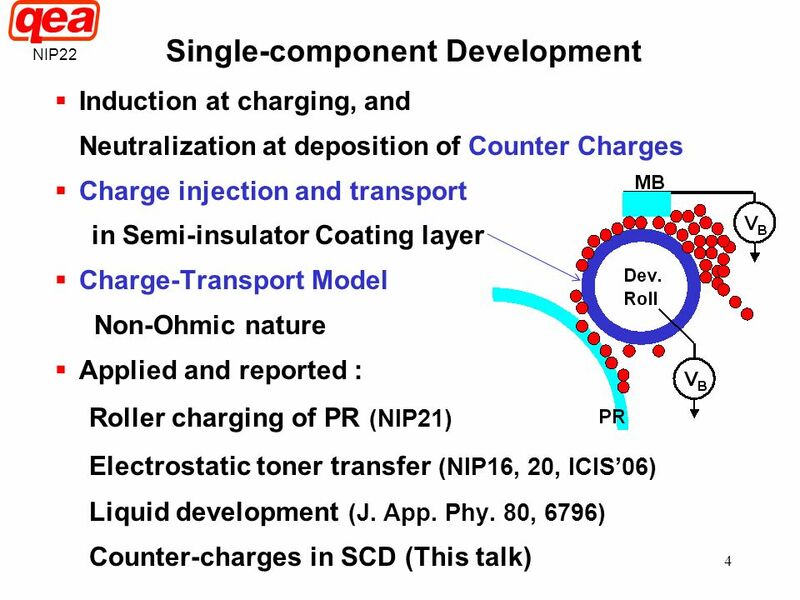 NIP22 Single-component Development Induction at charging, and Neutralization at deposition of Counter Charges Charge injection and transport in Semi-insulator Coating layer Charge-Transport Model Non-Ohmic nature Applied and reported : Roller charging of PR (NIP21) Electrostatic toner transfer (NIP16, 20, ICIS’06) Liquid development (J. App. Phy. 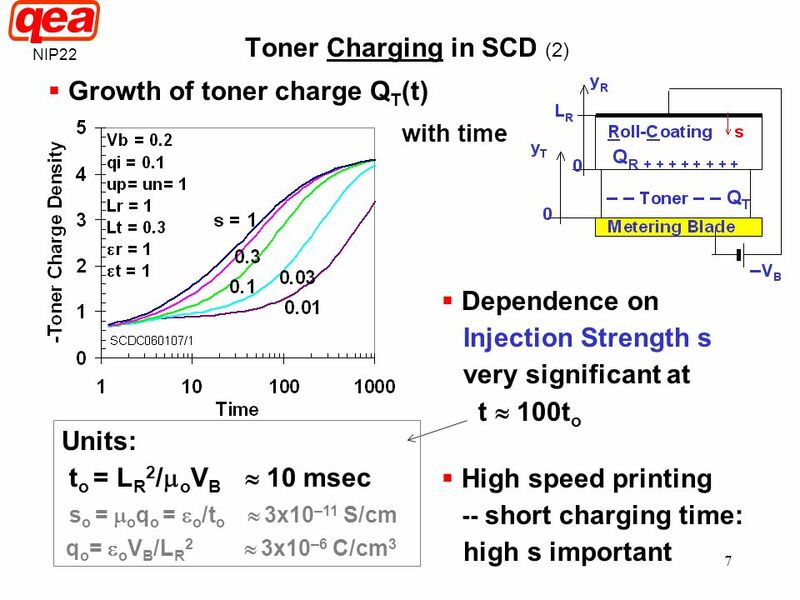 80, 6796) Counter-charges in SCD (This talk) This Induction and Neutralization of counter charges are achieved by charge injection and transport in the semi-insulator coating layer. We have developed a charge-transport model, which considers the non-Ohmic nature of charge injection and transport in the semi-insulating overcoat layer. The model has been applied to Roller charging of PR’s, Electrostatic transfer of toners to media, and Liquid development, and reported at previous conferences and journal. Today, we’ll apply the model to investigate the induction and neutralization of counter-charges in SCD. 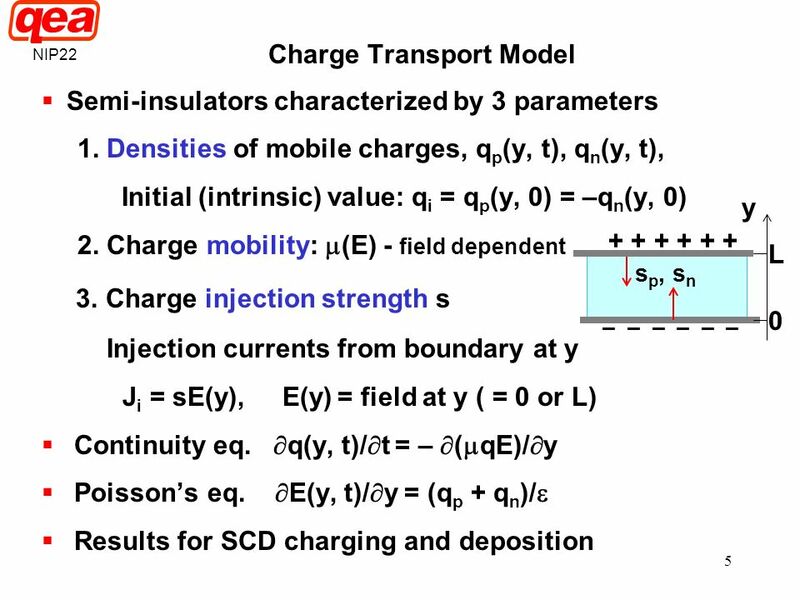 NIP22 Charge Transport Model Semi-insulators characterized by 3 parameters 1. Densities of mobile charges, qp(y, t), qn(y, t), Initial (intrinsic) value: qi = qp(y, 0) = –qn(y, 0) 2. Charge mobility: m(E) - field dependent 3. Charge injection strength s Injection currents from boundary at y Ji = sE(y), E(y) = field at y ( = 0 or L) Continuity eq. q(y, t)/t = – (mqE)/y Poisson’s eq. E(y, t)/y = (qp + qn)/e Results for SCD charging and deposition sp, sn – – – – – – y L In this model, the charge transport in semi-insulating layer is characterized by 3 parameters: 1. Density of mobile positive and negative charges, qp and qn, having the initial, or intrinsic value: qi; 2. The charge mobility m, generally field dependent. The product of m and qi is the conductivity s. And the third is the charge injection strength s. The injection current Ji from the layer boundary at y is given by the product of s and the field E at y. The continuity equation and Poisson’s equation are used to calculate the time and spatial variations of q and E. The numerical results for SCD charging and deposition steps are discussed in the following slides. NIP22 Toner Deposition in SCD (1) Fields and Voltages in layers Photoreceptor: EP, VP Toner-layer: ET(y), VT Roller coating: ER(y), VR Bias voltage: -VB = VP + VT + VR Gauss’ theorem relates charges QP, QR, QT to E’s Field in toner layer: ET(y, t) = ET0 + (QT/e)(y/LT) (detail in Proc. paper) = func. [VB, QP, QT, QR(t), UR(t), L’s, e’s] Injection & transport of Counter-charges in RC contribute to QR(t), UR(t) QT Now, for toner-deposition: This figure shows a layer geometry of the development nip, consisting of the photoreceptor, the toner and the roller coating layers. The applied bias voltage VB is equal to the sum of the three layer voltages. The Gauss theorem relates the layer charges to the fields. 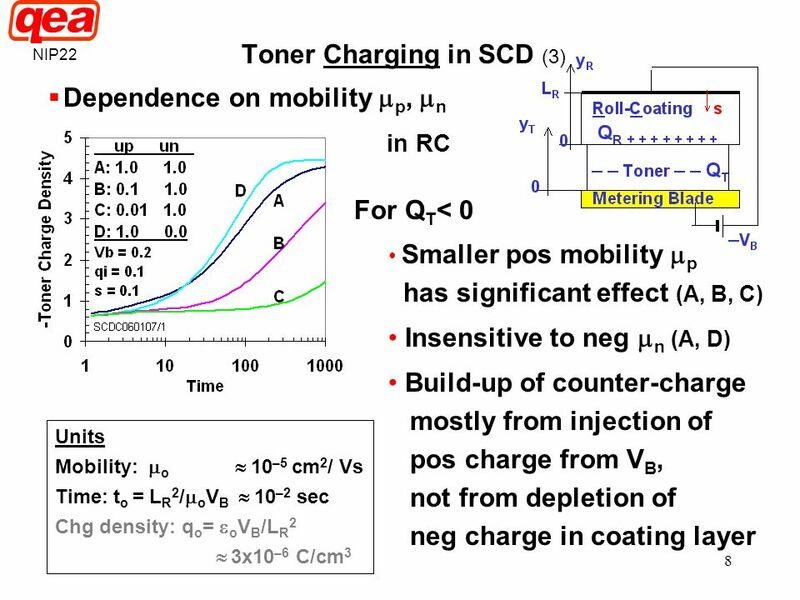 Then, the field in the toner layer ET can be expressed as a function of the bias voltage VB; the charge densities QP, QT and QR; the integral of mobile charge densities in the coating layer UR, and the layer thickness and permittivity. The injection and transport of counter charges contribute to QR and UR. NIP22 Toner Deposition in SCD (2) Negative toner deposition: ET(y, t) > 0 Demarcation line at y = YD ET > 0 for y < YD ET < 0 for y > YD ET(YD) = ET0 + (QT/eT)(YD/LT) = 0 Deposition efficiency: YD/LT = – eTET0/QT = func. [VB, QP, QT, QR(t), UR(t), L’s, e’s] (in proc. paper) QR(t), UR(t) from Transport Eqs. 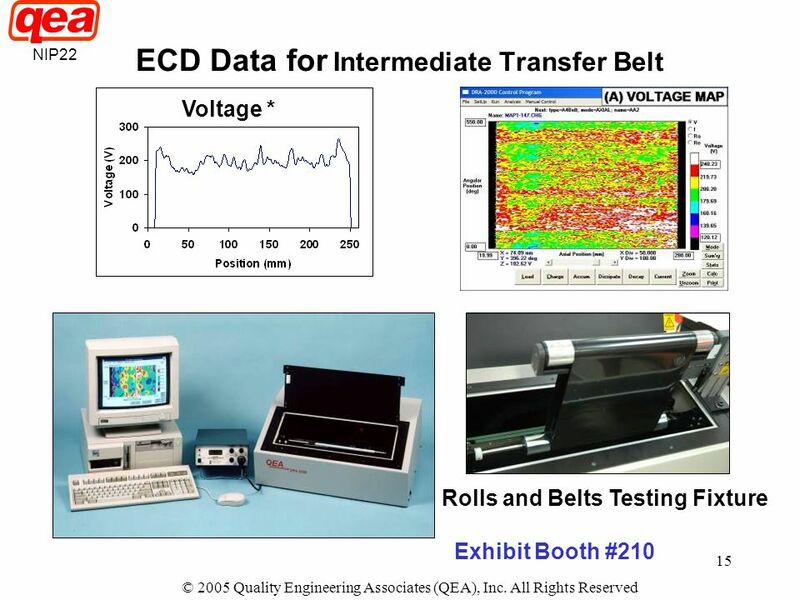 Time evolution of Deposition efficiency YD/LT –LP PR Roll Coating (RC) –VB – – Toner – QT QP LT y QR YD For negatively charged toners to be deposited on the PR, a positive ET is required. If a demarcation line at y = YD separates the toner layer with positive ET(yT) from that with negative ET(yT), then ET at YD is = 0, and the ratio of YD to the total toner thickness LT can can represent the efficiency of deposition. 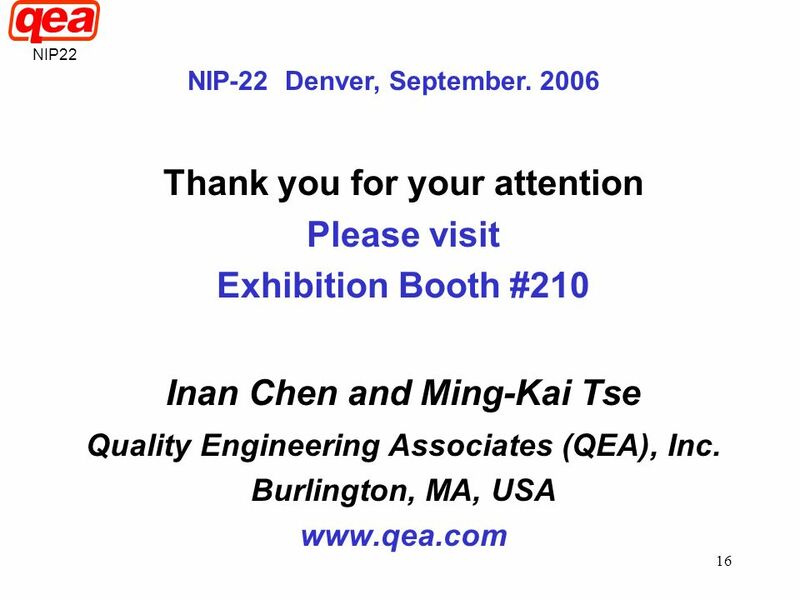 We can calculate the contribution of counter-charges to QR and UR as functions of time from the charge transport equations, and examine the time evolution of the deposition efficiency YD/LT. 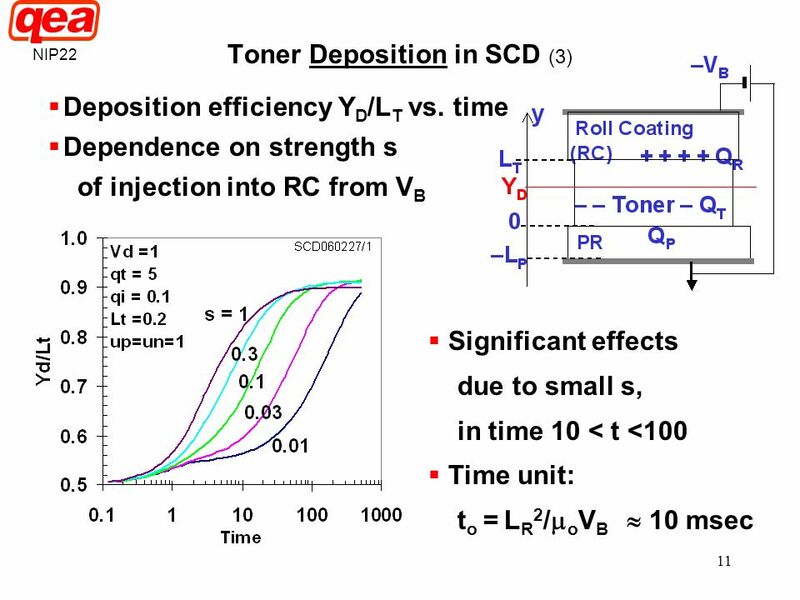 NIP22 Toner Deposition in SCD (3) Deposition efficiency YD/LT vs. time Dependence on strength s of injection into RC from VB Significant effects due to small s, in time 10 < t <100 Time unit: to = LR2/moVB  10 msec This figure shows examples of calculated deposition efficiency. In particular, it shows the dependence on the strength of charge injection into the coating layer from the bias. We can see a significant effect of reduced injection s in the time ranges from 10 to 100 time units. Here, the normalized time unit, as mentioned before, has a value of the order of 10 msec, in typical applications. 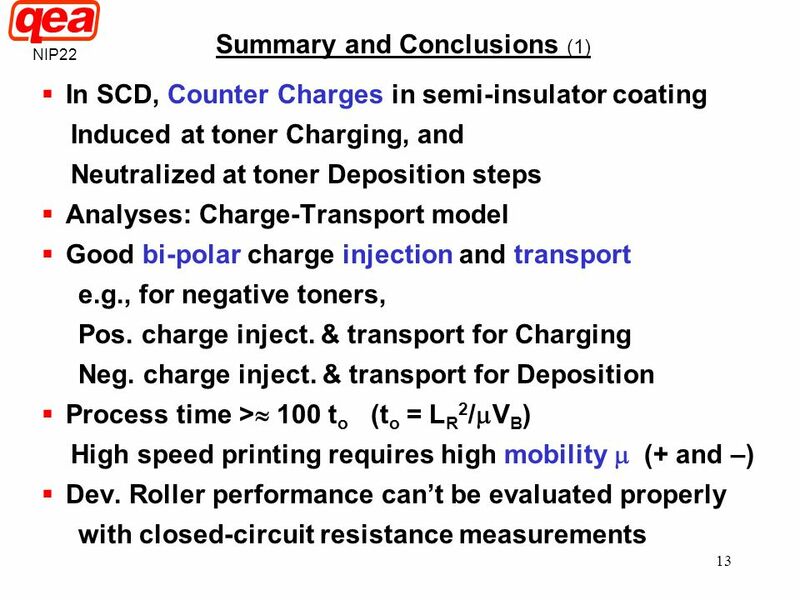 NIP22 Summary and Conclusions (1) In SCD, Counter Charges in semi-insulator coating Induced at toner Charging, and Neutralized at toner Deposition steps Analyses: Charge-Transport model Good bi-polar charge injection and transport e.g., for negative toners, Pos. charge inject. & transport for Charging Neg. charge inject. & transport for Deposition Process time > 100 to (to = LR2/mVB) High speed printing requires high mobility m (+ and –) Dev. Roller performance can’t be evaluated properly with closed-circuit resistance measurements In summary, we have shown that counter-charges in the semi-insulator coating layer must be efficiently induced at the charging step, and efficiently neutralized at the deposition step. Our analyses based on charge-transport model indicate that this requires good bi-polar charge injection and transport. For example, if the toner charge is negative, positive charge injection is required for charging, and negative charge injection for deposition. In addition, we find that the process takes more than 100 time units. The definition of time unit suggests that for high speed printing with short process time, high mobilities m, for both positive and negative charges are very desirable. Because of these complex requirements, the performance of roller coatings cannot be evaluated properly with the conventional method of closed-circuit resistance measurements. 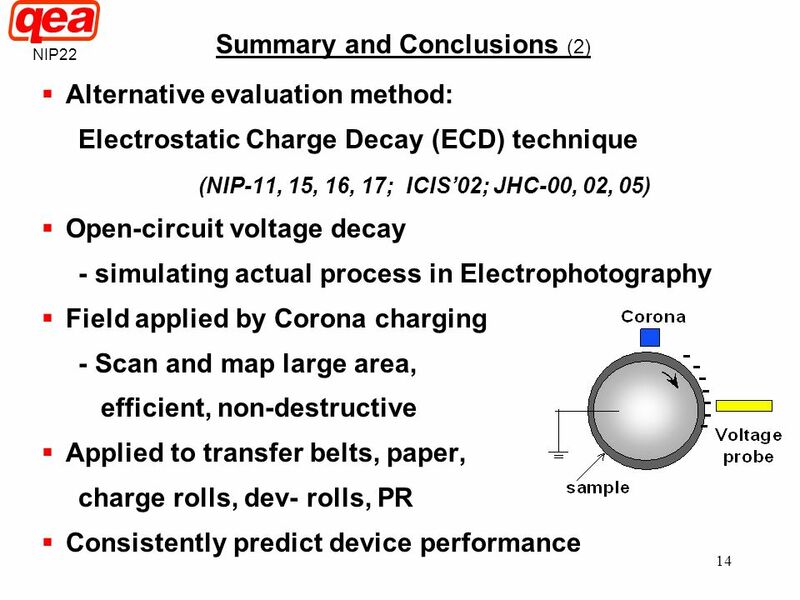 NIP22 Summary and Conclusions (2) Alternative evaluation method: Electrostatic Charge Decay (ECD) technique (NIP-11, 15, 16, 17; ICIS’02; JHC-00, 02, 05) Open-circuit voltage decay - simulating actual process in Electrophotography Field applied by Corona charging - Scan and map large area, efficient, non-destructive Applied to transfer belts, paper, charge rolls, dev- rolls, PR Consistently predict device performance We have developed an alternative evaluation method known as ECD, introduced at previous conferences. This technique is based on measurements of open-circuit voltage decay, simulating the actual process in EP. 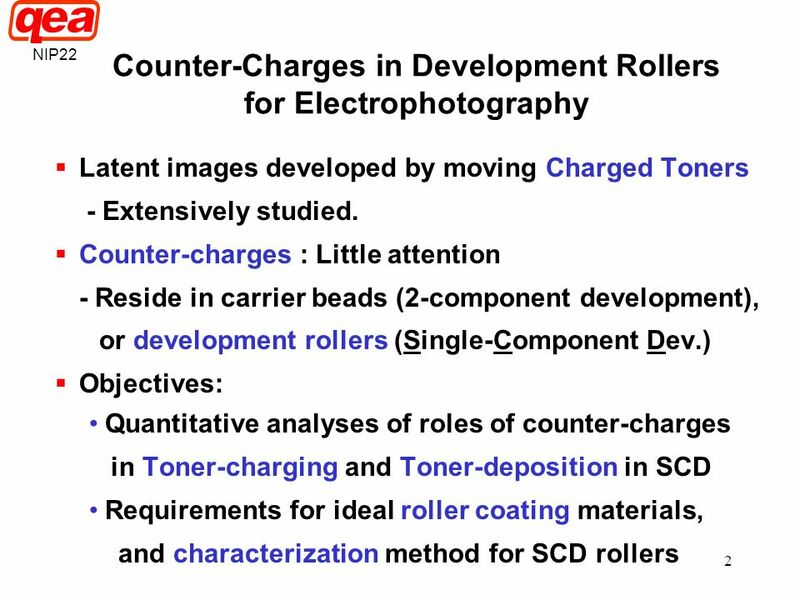 Download ppt "On Counter-Charges in Development Rollers for Electrophotography"